Bella Rose Bed and Breakfast, located in historic Canandaigua, NY, in the heart of the Finger Lakes Region, is fully renovated with exquisite attention to detail. Three distinctly different and tastefully decorated guest rooms with ensuite baths and modern amenities will leave you wanting nothing. Modern features such as central a/c, fireplaces, Jacuzzi-like tubs, and a complimentary, stocked fridge marry well with this classic, unadulterated Victorian beauty. Romantics particularly should checkout our spacious two room suite with double jacuzzi-type tub, large fireplace and the only private balcony on Main Street. Easy walk to shops, restaurants and historic attractions. Canandaigua Lake and the New York Kitchen are about a mile away. If wineries or breweries are your passion, more than 150 opportunities for tastings are all within easy reach by car. 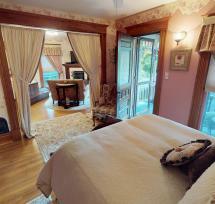 Come, relax and enjoy the splendor of times past at Bella Rose B&B and picturesque Canandaigua, NY, the "Chosen Spot." Our "almost-famous" three-course breakfast makes this romantic getaway destination for foodies the perfect escape.